« What is the risk of aortic rupture during TEE in “dissecting” aneurysm ? Idiot’s approach to cardiac arrhythmias : A new Algorithm based on heart rate & QRS width ! Heart rate of a tachycardia is the simplest of all . . . but neglected parameter by physicians. They are often seen spending hours together for decoding arrhythmia , splitting their brain for locating P waves , VA conduction, Fusion beats etc Finally , most end up either administering Amiodarone a broad spectrum anti arrhythmic agent or a DC shock without arriving at a correct diagnosis. Here is an unusual algorithm for arriving at a diagnosis in all tachy-arrhythmais based only on heart rate and the width of the qrs complex with acceptable accuracy. 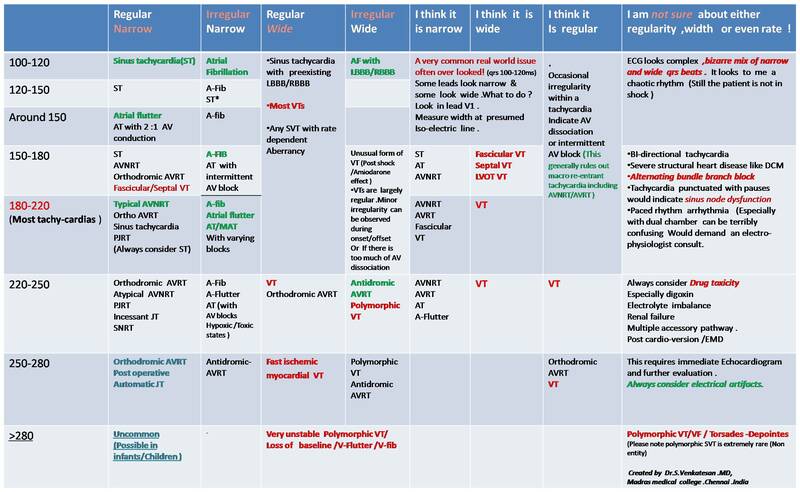 The above table is an extremely simplified approach for tachy arrhythmias. Not applicable for scientifically inclined . But in my personal opinion , in an emergency room pure science matters less !